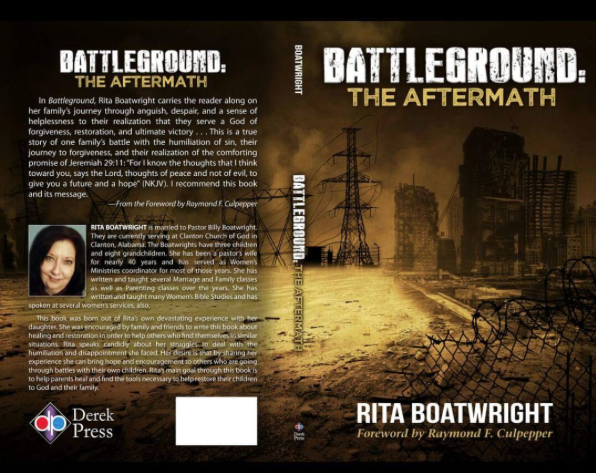 In Battleground, Rita Boatwright carries the reader along on her family's journey through anguish, despair, and a sense of helplessness to their realization that they serve a God of forgiveness, restoration, and ultimate victory ... This is a true story of one family's battle with the humiliation of sin, their journey to forgiveness, and their realization of the comforting promise of Jeremiah 29:11: "For I know the thoughts that I think toward you, says the Lord, thoughts of peace and not of evil, to give you a future and a hope" (NKJV). I recommend this book and its message. RITA BOATWRIGHT is married to Pastor Billy Boatwright. They are currently serving at Clanton Church of God in Clanton, Alabama. The Boatwrights have three children and eight grandchildren. She has been a pastor's wife for nearly 40 years and has served as Women's Ministries coordinator for most of those years. She has written and taught several Marriage and Family classes as well as Parenting classes over the years. She has written and taught many Women's Bible Studies and has spoken at several women's services, also. This book was born out of Rita's own devastating experience with her daughter. She was encouraged by family and friends to write this book about healing and restoration in order to help others who find themselves in similar situations. Rita speaks candidly about her struggles to deal with the humiliation and disappointment she faced. Her desire is that by sharing her experience she can bring hope and encouragement to others who are going through battles with their own children. Rita's main goal through this book is to help parents heal and find the tools necessary to help restore their children to God and their family.